When it’s cold, the compressor will continue to start up reliably to keep the temperature inside the freezer right where you set it. When it’s hot, the compressor has the capacity to run often and for extended times. Proven to perform in temperatures from 0°-110°F. Chest and upright freezers come in a variety of sizes to fit your needs. It's a visual assurance that your food is safe. They make space more flexible and items easier to find. With a door that locks to help keep children out, this 10.6 cu. ft. GE Chest Freezer offers optimal storage capacity for your frozen items. The freezer features 3 lift out sliding bulk storage basket to help ensure that you have room to store and organize your favorite frozen foods. Its defrost water drain allows for easy defrosting. the temperature says -10 to 15, is this C* or F*? Would like to know if I can use this as a fridge and keep the temperature above freezing. Which side is the power cord on and how long is it? Also can a 15 amp outlet handle the freezer with no problems? Hi is it 220 volt? No, this is not a 220-volt freezer. 10.6 cu. ft. 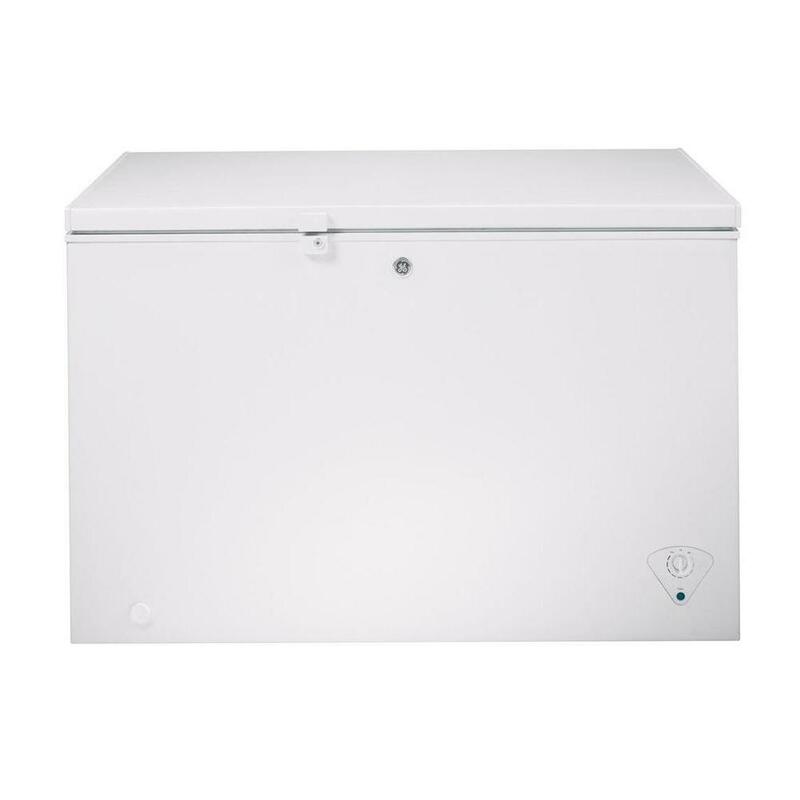 Chest Freezer in White is rated 4.7 out of 5 by 1084. Rated 5 out of 5 by Pete from We are very satisfied with the purchase of this 10.6 chest freezer as our previous one bit the du... We are very satisfied with the purchase of this 10.6 chest freezer as our previous one bit the dust. We had a 15 or 16 cu, ft. but decided it was really too large and decided to down size to the 10,6 for convenience of a smaller one. We were sort of shocked when it was being unloaded. It was really as long as the other one but not as wide which we really like. We are really happy with the three baskets as well. I would highly recommend this purchase to anyone needing a small chest freezer. We do not have a photo with our freezer in action to post!!! Rated 5 out of 5 by Pleased from So far I'm very pleased. It is spacious and well insolated. The three baskets are a nice feature ... So far I'm very pleased. It is spacious and well insolated. The three baskets are a nice feature as well. We have not had it long enough to worry about defrosting so I can't speak to that. The light on the Inside is great allowing us to see what we have without turning on an overhead light. Rated 5 out of 5 by JSL from I've only had it for a month. Love the... I've only had it for a month. Love the size! and baskets. The interior light is a great option.It cooled quickly, no frosting up and the lid seal is great.Very happy so far. We will see if it survives longer than a few years. The Amana I bought died in 2.5 years, so I'm trying the GE. Rated 5 out of 5 by VictoriafromRamsey from Falling in love with this chest freezer by the day.... Falling in love with this chest freezer by the day. Went into the purchase thinking there would be limited use but surprised by how much smarter we can be at shopping and preparing meals. Glad I didn’t go with a small chest freezer. We’re a family of 5. Rated 5 out of 5 by Dennis from Turned out to be bigger but better than expected. A... Turned out to be bigger but better than expected. A whole cow would probably fit. Its extremely quiet. Rated 5 out of 5 by Jo from I have had this for less than a month .so far so good .everything work as it should. I have had this for less than a month .so far so good .everything work as it should. Rated 4 out of 5 by Neil from Happy with the purchase. The freezer is larger than anticipated.... Happy with the purchase. The freezer is larger than anticipated. Rated 5 out of 5 by CKRAZE from Well built freezer, good price. I bought this freezer when I realized my small chest freezer wouldn't be enough to hold the amount of deer meat I got in the first week of the season. This freezer is large enough for over 130lbs of venison and still only be about 60% full. It is dead quiet, and the baskets on top come in handy. I use them to keep the higher cuts of meat in so I don't have do dig through 100lbs of burger and sausage to find them. It's only supposed to use up about $65 worth of electricity per year and so far I can't even see a difference in my electric bill. Oh, and it went from the box to cold enough to freeze meat in about 2 hours when I first plugged it in. It holds the temperature perfectly.